Sometimes events in life take you by surprise. Our baby was born with a rare case of neonatal diabetes. I am writing the blog that I wished I could find when he was first diagnosed. I hope to inform those individuals who've never heard of it and I especially hope reach out to parents in similar situations. I've pretty much summed up our experiences in the hospital. Before moving on, I thought I'd jot down a few things we learned. Perhaps a ride up to the hospital- we didn't ask for this, but it was a lot of driving and occasional company would have been nice. Yard work- many things take a back seat during times of crisis. The flowers and vegetables are two of those things. If planning to planning to provide breastmilk for your baby you'll want access to a quality pump as quickly as possible. I already had a hand pump, but that was insufficient for all the hours I was away from the hospital. Plus it didn't do nearly as good a job as a quality electric pump or a hungry baby for that matter. I rented a hospital grade for a brief while then bought a Pump In Style which worked very well. I packed a water bottle, a camera, a notebook for jotting down information from the doctors or nurses, journal articles relating to neonatal diabetes, a laptop, a granola bar, extra nursing pads, extra regular pads (I was still recovering from childbirth after all! ), hard candy, labels for Bean's milk containers, a sharpie, some money, and the Wall Street Journal or sometimes a book. It was a pretty full bag! Very, very tough to do, but vital. Rest is especially important when recovering from birth. I found that I needed some periodic naps. A nurse once commented, "Oh when he comes home you'll wish he were back in the hospital at night so you can get rest." Uh, no! I looked at her like she was out of her mind. The pumping in the middle of the night and all of the worry wasn't exactly restful as it was. When he did come home it was a brutal sleep schedule, but not once did I wish him back in the hospital. 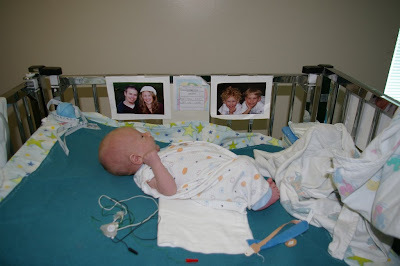 They had a great program where older siblings could decorate their own cloth NICU baby with the wires and tubing to match their own baby brother's or sister's. Then there was a little class taught by an RN about the machines and equipment around their brother explained in simple, not scary terms. They also got to decorate a framed picture of baby Bean. The hospital was very sibling friendly and there was a wonderful playroom they could visit, and of course they got to see baby Bean a few times. My older two children pretty much took everything in stride thanks in part to these programs. Spending time rocking, holding, nursing, or even just touching gives a smidgeon of normalcy in a difficult situation. I found rocking Bean a great way to soothe both of us, and I could close my eyes and imagine the hospital surroundings away. The nurses, nurse practitioners, and doctors were appeared very happy to answer questions or address concerns we had. We found that even if we missed the rounds, a doctor or nurse practitioner would be more than willing to come to the bedside when they had a free moment to talk to us. While away from the hospital, call and ask about your baby. It's not the same, but will give you some peace of mind hearing how things are going. 8. Along the lines of #7, Educate yourself! For the most part the more I knew the less scary and more confident I felt. I read articles on neonatal diabetes, both permanent and transient since we didn't know right away which he had. I also read about managing diabetes in young children and learned about how the pancreas works, the KATP channel, different kinds of insulin, how to administer shots, A1Cs, glucometers, and on. Most of the time I was quite content just being with Bean, but occasionally it was nice to have a friend there in the hospital to talk to as well. 10. Take some time away from the hospital to do things you enjoy. My husband and I went to a restaurant for a lunch date. It was nice to feel the summer breeze and just talk. Another time my husband went up to the hospital while I spent time with the kiddos, made them pancakes and read stories. I also enjoyed soaking in a hot tub after a wearying day. I'm sure others can think of more. Anyone? Bringing Bean back from the hospital is like a second birthday. It is wonderful, wonderful, wonderful, to have him home again! I like hearing his little chirps and grunts in the night and it is much nicer to wake up to nurse him rather than go to a pump. We check his blood glucose levels every three hours and he receives a minute dose of Lantus twice daily. His levels were great through the night, but climbed sharply this morning, so the endocrinologist advised giving him .75 units rather than his usual .5 units this morning. (You have to have eagle eyes to draw up such a tiny amount...) Checked again 30 minutes ago and his sugars are back to a respectable level. Bean also gets NaCl 4 times daily (mixed with milk to get it down) in order replenish that which he loses in urine. I've also found that I still need to pump some, despite Isaac being a great eater, so it works out. Our freezer has a good sized bin overflowing with milk containers that I pumped while he was in the hospital. I'm pleased that I was able to keep up with him and then some. He's now about 7 and a half pounds. Between Thursday and Friday night he put on 205 grams. The nurses couldn't believe it, so he was weighed 3 times. I think this child would have been a good 8+ pounder at birth if it weren't for the diabetes. While it is great to have him back, whatever I was drawing energy from these past two weeks seems to have evaporated. I am tired. Happy, but tired. The thought of getting behind the wheel of a car feels a bit too daunting right now. I don't even want to get dressed! But Bean is home and I am at peace. That's not to say it was stress free by any means! Every time he fussed or slept longer than we expected we wondered if he was too high? too low? or perhaps this was just normal behavior for him? That poor child got poked very frequently. Thankfully we had access to the diabetes line for any questions. Each morning for the first few days home we'd call in his numbers too for the endocrinologist. That Saturday we arrived before eight so as to be there to give Bean his morning dose Lantus. The pharmacist said we could always practice with saline on him if it was too early, but why give him more pokes then absolutely necessary, we figured. I gave him his shot. Not my favorite thing to do, but I was glad to have the nurse there to supervise at least once. Since confidence in drawing up insulin and giving shots was a necessary prerequisite to Bean coming home, we were prepared to do it. The discharge process was quite long and Jay had to leave to speak at a conference part way through. When he got back, the pharmacist showed us how to use glucogen. Eeep. We were really hoping to never need that... the problems with hypoglycemia seemed terribly frightening. She gave us some more information on Lantus and Humalog (the quick acting insulin to be used to correct highs). Bean's Humalog had to be specially diluted twenty times by the pharmacy so we could actually draw it up in a syringe. Still he didn't need very much, so that is where the 1/2 unit markings on the syringe came in handy. Then there was some confusion with the pharmacy so we had to wait for them to mix up Bean's insulin to take home. This took several hours. Jay and I just rocked Bean, took some pictures, and waited. Around six that evening we finally got the green light to head out. Bean's nurse walked us to the car with all of his supplies. Hooray! We drove home just ecstatic to have him with us. The weight of responsibility hit shortly after we arrived home- just in time to check his glucose and administer his evening dose of Lantus. We were now in charge of monitoring his blood glucose at least every three hours around the clock. On top of that we were to give him sodium four times a day mixed with fresh milk to get it down. Came back from lunch today to find Bean's nurse rocking and cooing over him. He'd woken up a little early so she was keeping him busy until I got up to feed him. He is a snuggly baby. I do wish I could request specific nurses. Bean and I both approved of her. While some nurses are all business, others really seem to enjoy the little ones. Spoke with the endocrinologist today. He showed me some insulin graphs. Apparently even on Lantus, individuals who don't produce insulin will have higher peaks and valleys. Bean has been fairly stable, leading the endocrinologist to believe that Bean is able to produce more insulin now. He does well for about 18 hours on one dose of Lantus and then the endo theorizes that his pancreas cells give out and the Lantus also peters out. It trends upwards fairly sharply after that point. I asked about doing another C-peptide test, and he said that was something we could definitely do down the road. It would show whether his insulin levels have increased, but he was sure just by looking at his glucose levels that he was producing more. Great news! Perhaps, perhaps, this is transient diabetes. Still not possible to tell, but maybe! At any rate he only needs a small dose of Lantus, so that in and of itself is great. I was chit-chatting with one of the few male nurses I've seen, a gentleman probably in his late 50s. He was friendly guy who liked to talk. I asked him how long he'd worked at the children's hospital and he said 4 years. "Oh, so where did you work before that?" "I was in construction for 25 years before that." How's that for a career change?! Very cool. Around noon I saw a woman in the scrubbing up room of the NICU. She had a heplock still in her hand, and I asked if she'd come from the hospital. "Yeah, I just had my baby this morning." Several days ago, when I was in the mother's room pumping, Jay recognized a woman passing in the hallway. "Hey, I think you delivered my son nearly 6 years ago at (a nearby city hospital)." Bean continued to impress with his weight gain. Every morning at rounds the bedside nurse would state how many calories he'd consumed (not including the two or three nursing sessions) and the doctors' eyes would pop in surprise. Bean was doing his best to make up for lost time. Minus the diabetes I suspect he'd have been a 9+ pound linebacker at birth. That's over a pound since previous Friday! After lunch I came back up to feed Bean. His nurse swapped with another nurse at 1:00 because the NICU had some new admits and the nurses got shuffled around. I found her with the phlembotomist using the ISTAT reader (lab reader) to test his glucose. I asked what was going on...his sugar was supposed to be read by his glucometer throughout the day and 1x in the morning compared with the ISTAT. She'd been led to believe that his sugar was supposed to be read with the ISTAT throughout the day and the glucometer used once in the morning. So she tracked down Bean's nurse practitioner who clarified things and wrote a clear (I hope!) order in his charts. Bean's bedside nurse apologized up and down. Really it wasn't her fault, I understood. I sure was glad to be there to correct this, though. The ISTAT requires so much more blood, and to have it done 8 times a day would have Bean terribly anemic in no time. The ISTAT lab reader ended up erroring out, so it didn't even get a glucose reading. I showed his nurse how to use the glucometer (she'd never used this type before) and got his glucose number. His nurse in turn made a very clear sign in large letters explaining how and when Isaac's sugars were to be tested and hung it on his crib. His blood glucoses are much more stable, and they are starting to talk about a going home time line! He's on Lantus twice a day, and none of the regular quick acting insulin. This morning his sugars were actually a little on the low side, so there's still some tweaking still going on. His doctor commented that in a week he will likely need the current higher dose with the rate he is eating and growing. They aren't used to such great eaters, but this is a typical Ellis kid for me. Things are looking very good. I am a happy mama! Wednesday we had our first diabetes class. Bean's NP scheduled an appointment for us at 2:00 with the hospital Diabetes Instructor. Under the impression that someone would know where the instructor was, I showed up at 1:55, to find out that I was mistaken. The only thing anyone could tell us was that she was on the third floor. The third floor is BIG. I was a man on a mission, so when the first person I asked for directions had no idea where to look and disappeared, I left Fay (who didn't want to appear rude by leaving before she got back) and found someone who did. Instructor located, I went and found Fay and we got started. I took my blood sugar with the lancet. (112.) It took me 3 tries of increasing lance depth to get enough blood. Turns out the sides of the fingers have less nerves, which was news to me. I will have to let those clowns at the Red Cross know about that next time; they always jab the center for their tests when you donate blood. Then we learned how to give insulin shots, practicing on an orange first. Then I gave Fay one in the back of her arm, and she returned the favor. Surprisingly, puncturing skin does feel like puncturing an orange -- a little resistance at first, then it slides in smoothly. The needles are tiny, much smaller than the ones you'd use for your immunization shots. Feels like a bee sting, only it fades away faster of course. Fay almost wondered why Bean makes such a big deal out of it, but he doesn't have nearly as much fat as we do which probably makes things more painful. So this was Step One towards getting Bean home. Nobody is willing to make a prediction yet, only repeating that he can go home "when he's stable." But this is a Very Good Sign. Just in time, too; having to choose which of her kids to be with is really taking a toll on Fay. On the "hospitals make you count your blessings" note: as I left, I saw a little girl Missy's age zipping along in her walker, minus her left leg. I tried not to stare, but when she and her dad had passed, I turned and watched for a minute. Both of us felt much more optimistic and cheerful after the class. A very good sign indeed! By Tuesday, August 26th Bean had been in the hospital for 11 days. Emotionally and physically it'd become very draining. Add that to some changes that occurred Tuesday night, and it was just overwhelming. This is a pity post; you have been forewarned. Took the kids to see Bean tonight, and went to his room only to learn he'd been moved. I get to his new location and the phlebotomist is there using the lab reader to check his glucose. I ask his bedside nurse what was going on, why weren't they using the glucometer? Apparently someone is in a tizzy again about the glucometer being used because there isn't a protocol written for it for the NICU and the nurses aren't trained in how to use it. What the?!? Aren't trained??? It takes less than 5 minutes to be "trained" to use this device. I look around the room and see pumps, drips, lines, ventilators, and other complicated pieces of equipment, and a glucometer is out of the realm for training!?! ARHHHH! The bedside nurses who have used it with Bean have had no problem, and the lab reader requires much more blood than the glucometer. Bean has already had 2 blood transfusions due to all the blood they've needed to take out of him; I'd like to avoid a 3rd, thank you very much. Plus, when we go home, we will be using a glucometer, not a high end lab reader. Later that evening I spoke with the NP when she finally got out of a meeting. She agreed to allow the glucometer for the evening, but it looks like we may be in for round 3 in this fight tomorrow. I don't get the bureaucracy, his doctors have approved it for his use. They've gone all the way to the head of the NICU. Why, oh why does this keep coming up? I looked at Bean's poor heal this evening. It seems the nurses favor his right heal, and it is dark purple and scabbed over with pokes. His other heal is not bad, and neither are his fingers. Tomorrow I'm going to talk with the nurses about using other parts of his anatomy to stick. The room we were in was an isolation room. Bean was placed there because he came from home. It was quiet and somewhat private. Now he's in a big open room with lots of other babies. It is incredibly loud. Nearly every baby was crying, and we seemed to be right next to the nurses' gossip station and they were quite loud too. It was yak, yak, yak, amid the wailings, and beeping of the monitors. Poor Bean. I'm also concerned because he is right next to another baby with the same name (though spelled slightly differently). What if someone isn't paying attention or gets careless with medication or procedures? Bean is also sharing a nurse with a baby on the opposite side of the room that has many wires and tubings. This has me concerned that little attention will afforded to him because it's just not possible. I know his basic needs will be met, but no one will hold and rock him when I'm not there. And he needs to be held! Who will comfort him when he cries? No one will be there to love him, when I'm gone. I hate, hate, hate this situation!!!!!!! It just rends my heart to leave him, and now I am very worried. My heart is torn in two. I worry and miss Isaac when I'm home, and I feel terrible about missing out on time with Matt and Missy when I'm at the hospital. I should be there to pick Matt up from kindergarten and hear all about his day when it is fresh on his mind. I should be snuggling more with Missy and taking her to story time at the library. Instead I am a tired, sometimes cranky Mama, who is insufficient for any of my children. Endocrine development 2007;12:113-23. Imprinting in human disease with special reference to transient neonatal diabetes and Beckwith-Wiedemann syndrome. Hormone Research. 2007;68 (Suppl. 5):32-36 (DOI: 000110471). Neonatal Diabetes. Hum Genet. 2005; 116 (4), 255-61. Bisulphite sequencing of the transient neonatal diabetes mellitus DMR facilitates a novel diagnostic test but reveals no methylation anomalies in patients of unknown aetiology. Archives of disease in childhood. Fetal and neonatal edition 2004;89(4):F341-3. An assessment of pancreatic endocrine function and insulin sensitivity in patients with transient neonatal diabetes in remission. Hum Genet. 2002 Feb;110(2):139-44. Relaxation of imprinted expression of ZAC and HYMAI in a patient with transient neonatal diabetes mellitus. Welcome! I am not a medical professional and am not offering medical advise. I am a parent, learning as time goes by. I only hope that the experiences I share may be of some use to you. My husband and I had a small taste of what it is like caring for a child with diabetes. As a result I have a great deal of respect for the parents, children, and adults who live with and manage diabetes every day. 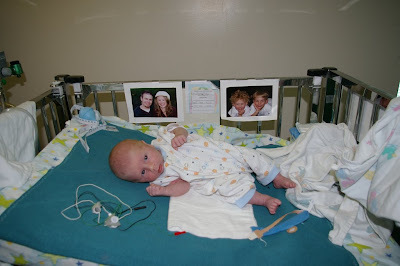 As it turns out, our son had the transient form of neonatal diabetes. He is at risk for developing diabetes again later in life, but we're just taking it one day at a time. Currently our baby is thriving and diabetes-free.